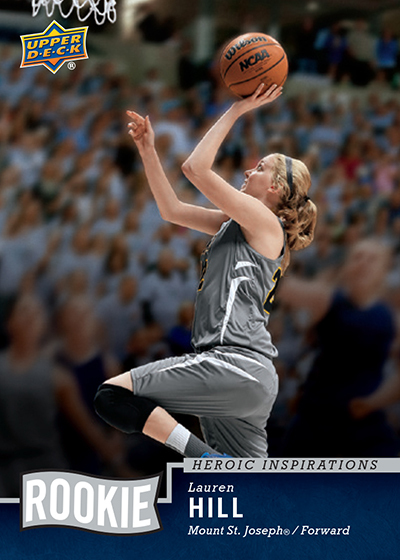 Lauren Hill's journey has been an inspirational one. She was set to play basketball at Mount St. Joseph University before being diagnosed with a rare form of brain cancer normally found in young children. Inoperable, the diagnosis was terminal. But that didn't stop Hill. 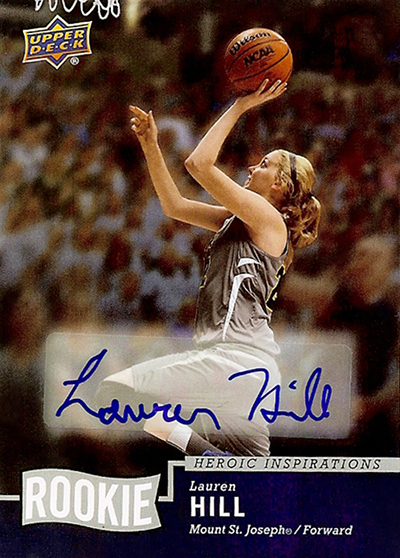 The runner-up for the 2014 AP Female Athlete of the Year, Hill now has a rookie card courtesy of Upper Deck's Heroic Inspirations series. Although diagnosed in 2013, Hill suited up to play in the NCAA Division III season-opening game between Mount St. Joseph and Hiram College on November 2, 2014. Originally scheduled for later that month, the game was moved up for Hill could play. As news of Hill's story spread, the game had to be played at Xavier University's Cintas Center to meet demand for tickets. More than 10,000 seats sold out in ten minutes. A typical Mount St. Joseph game would draw around 100 spectators. Hill started and made both the opening and closing basket's in the game, one that her team won 66-55. Over the next couple of months, Hill appeared in two more games. She has continued to raise awareness and more than $1 million for The Cure Starts Now Foundation. This is the organization that sales of the Lauren Hill card go towards. The front shows Hill making a layup from the Hiram game. The back has an inspiring write-up from the 19-year-old. 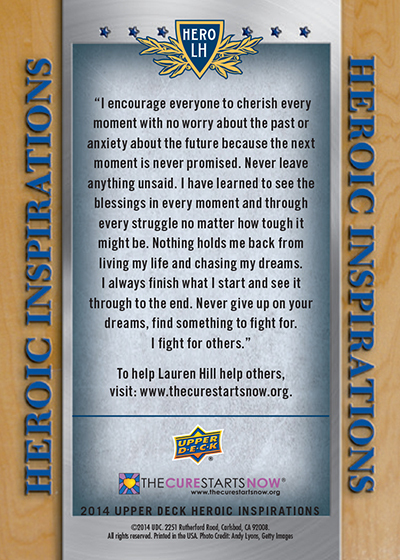 Available through The Cure Starts Now's website, the cost is $10 for a regular card and $50 for an autographed version. The website notes that the signatures are done on stickers. Shipping of the cards is only available to the United States. However, that doesn't mean you can't get it shipped to a friend if you live elsewhere.